Who’s ready for a trip aboard the Jingle Cruise? 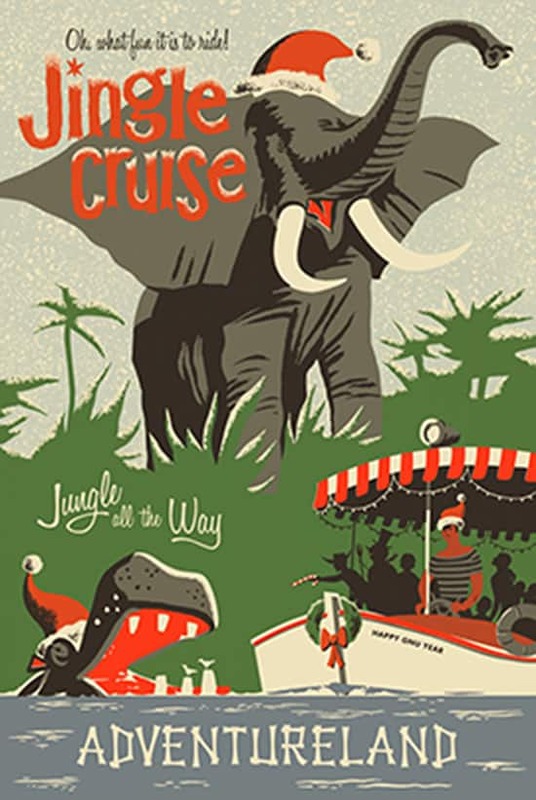 In case you haven’t heard, the Jungle Cruise attractions at both Disneyland park and Magic Kingdom Park will soon transform into the Jingle Cruise for the holiday season. In this seasonal takeover of the attraction, the Skippers are homesick for the holidays, so they decide to bring holiday cheer with them to work. 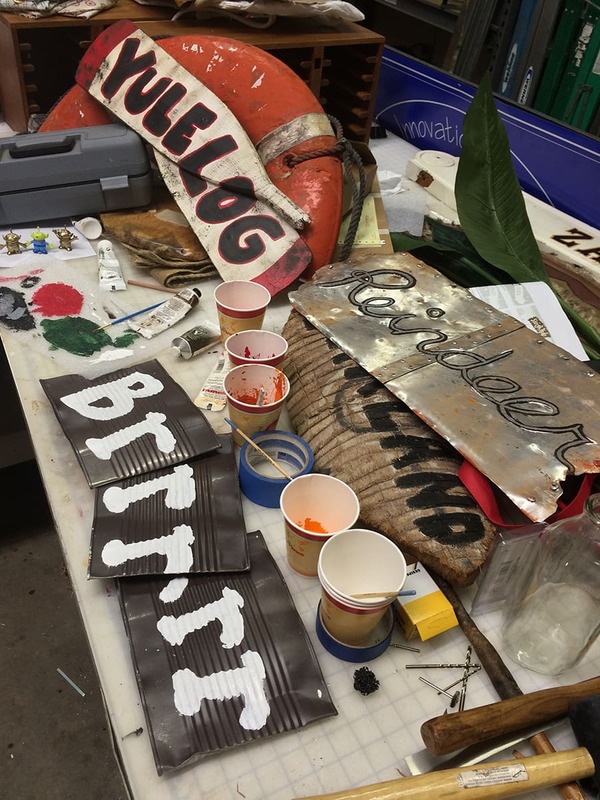 The attraction queue and boathouse will be decorated, the Skippers will add a slew of seasonal jokes to their tours, and even the Jungle Cruise boats will receive holiday names. Our friends at Walt Disney Imagineering just shared a photo that offers the first look at some of the holiday props in the works for the attraction’s overlay, which will debut at Magic Kingdom Park on November 8, and at Disneyland park on November 12. Holiday transformations will take place after park hours, so there is no expected down time of the attractions at either park prior to the debut. Will you visit the Jingle Cruise this holiday season? Tell us in the “Comments” section below! Woohoo, I love love love the IASW Christmas transformation. Adding a Jingle Cruise makes it even better. We will be there with bells on on Friday the 15th for the new WoC and this and perhaps a Yuletide cocktail at Carthay Circle. 🙂 Thanks for the info Jennifer. You guys HAVE to sell posters and some merch for this! Love it! We will be arriving for our very 1st DW trip! Can you recommend if riding the jungle cruise is better during day or night! Can’t wait!! Heading there tomorrow (11/9) soooo excited to ride the Christmas Jungle cruise!! WOO HOO!! Cannot even stand it!! Wish I wasn’t at work right now!!! I also wondered how long it will be at the park. We will be in the Magic Kingdom January 8th. Are decorations coming down before then? Hoo-ray!!! 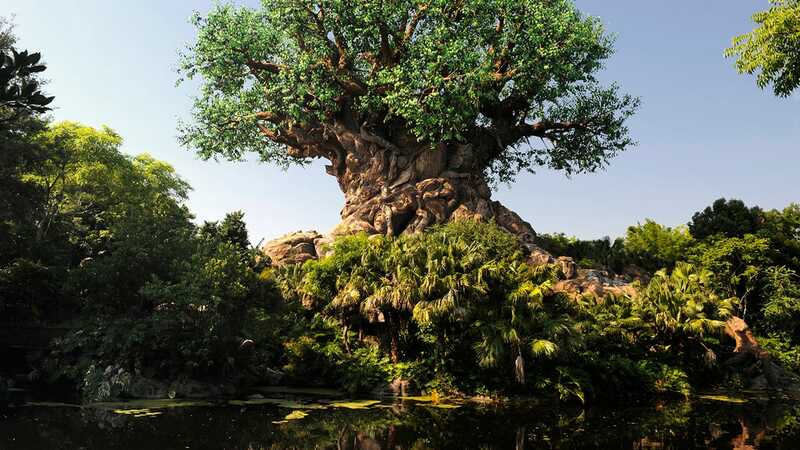 I’ll be at the Magic Kingdom in 3 days – Can’t wait to see it! I LOVE Jungle Cruise all the time but can’t wait for this special edition! Will there be Christmas decorations in the actual ride itself where the animals are? I’m hoping to work out a trip arriving on January 8th…will it still be there, Jennifer? I can’t wait, will be at WDW on December 23rd!! Taking my niece for the second time! She doesn’t even know yet, it’s her Christmas present!! I noticed three little green men on the left side of the picture that are being painted gold. I’ll be on the lookout for them while I’m on the cruise! Already got my Fast Pass + for December 7th. Looks awesome!!! Can’t wait to ride the Jingle Cruise. I love the poster and hope it’s for sale. Maybe a pin, too? I wish I was going while this is happening! Great idea Disney! I’m sure the skippers are chomping at the bit to spread some holiday cheer on the boat cruises… We will certainly check this out on our Holiday trip this year. Maybe more than once! Merchandise, merchandise, merchandise, please! I’m making a special trip just to see my favorite attraction dressed for the holidays. Very excited to see this attraction re-imagined as the Jingle Cruise! That’s great to hear, Mary Kaye. I hope you really enjoy it. Arriving the 10th of November…Jingle Cruise booked for later that evening! Anticipation building!! Will they still have it up for Marathon Weekend in January? We are bringing four of our grandkids (and their parents!!) for 10 days in December!! Can’t wait to show them all of the wonderful Walt Disney World beauty! The Jungle Cruse will definitely be on our list of things to do, probably more than once! Can’t wait to tour the Jingle Cruise on November 14th at the Magic Kingdom Park! This is our first WDW trip and first ever Holiday experience at a Disney Park. See you soon Mickey & Friends!! Will this be available as a poster or T-shirt? Need!!!! I’m soooo excited!!! Can’t wait to see & enjoy this ride! Coming down on December 3rd & now I have even more excitement to add to my first holiday experience at WDW!!! Also, I do hope they sell the poster—the first and only one of a kind! Thanks so much for all the updates. Looking forward to taking my 6 month old on it on the 16th. It will be his first time on the ride! Will the Jingle Cruise be open during Mickey’s Very Merry Christmas Party? Can’t wait to see it! Thanks. Checking in on Dec 28! Can’t wait! That attraction poster is beyond awesome. Must. Have. merchandise? will that poster be for sale? I looove jungle cruise,its always fun. Cant wait to see it xmasy. I hope you love it, Diana! yeah I would love that poster also! Please tell me you’re planning to sell that attraction poster! Any chance I’ll be able to purchase the attraction poster anywhere!? We will be there Christmas week to see it…so excited! When is this sticking around until? I love the concept! The Jungle Cruise is my all time favorite attraction!